More-able neurodiverse children, teenagers and adults need a perspective in which they can see their own experiences, their inner world, highs and lows reflected, their here and now and their dreams. A perspective that helps them understand the dynamics in society, politics, between people in all kinds of different situations, in intimate relationships, at school and also (later) at the working place. A perspective that helps teenagers to understand their own emotions, urges and stress in a workable framework, learns them to appreciate intensity as an indicator for giftedness and not only IQ, and shows them emotions can be the motor for personality development. A perspective that acknowledges and appreciates the crises gifted people often go through, that gives a positive meaning to those crises as necessary elements in their personal growth: there is definitely light at the end of the tunnel. A perspective that can give guidance and support on the moral path that gifted people often step on to and can spontaneously ignites an autonomous personal growth process, called ‘autopsychotherapy’. Dabrowski (1970) has developed a deep lived through, meaningful and well founded perspective and theory: Theory of Positive Disintegration (TPD), that is seen as the driving force in the social and emotional area of giftedness (Mendaglio, 2008). Dabrowski has become a very common reference in the gifted area. 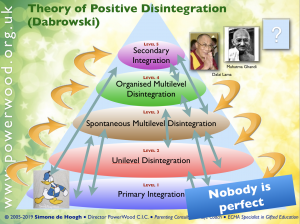 Theory of Positive Disintegration (TPD) receives growing attention and becomes subject of research (Yakmaci-Gu:zel, 2002; Mendaglio, 2008; Daniels & Piechowski, 2009; Kaaij & Mink, 2009; White, 2007). In new handbooks on giftedness, Dabrowski’s theory became a chapter (Jackson, Moyle, Piechowski, 2009) or he is the least mentioned (Pfeiffer, 2008). How does it Help Teens? Dabrowski’s Theory of Positive Disintegration (TPD)(1970) can make it possible for teenagers to find a path back to their strengths, to re-discover a place of security within from which to move forward with promise into their adult lives. They can be assured it is all right to want to use those strengths for the better of humankind. Teenagers can experience that within this theory their intense feelings, negative or positive, are acknowledged and appreciated and they may start to see possibilities again to build for themselves a meaningful life based on their, now permitted, own norms and values. 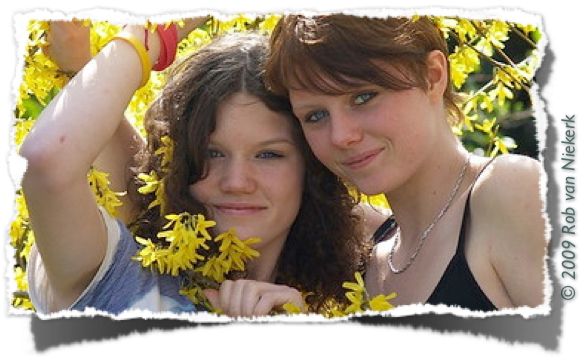 The knowledge about Dabrowski’s theory can spontaneously ignite an autonomous personal growth process, called ‘autopsychotherapy’ in teenagers and also adults. The theory doesn’t give direct answers but gives a holistic perspective with a higher aim that helps gifted individuals to understand their own position in the world and makes them able to see an individual meaningful path that they often spontaneously develop further. The Theory of Positive Disintegration can be a guiding principle in their further/remaining live. Whenever Parents and teachers hear about the theory, their interest is immediately piqued. To teachers, parents and carers it can give insights and tools to understand children and teenagers (and for parents often themselves) to blaze a new trail together. Knowledge about Dabrowski’s theories generates comprehension of teachers, parents and carers for gifted children and teenagers and makes them better equipped to guide them towards a fulfilling life. For example: to realise that suppressed OverExcitabilities can come out in disturbing behaviour can be clarifying and motivating to parents and teachers. Dabrowki’s theory makes is sometimes possible to recognise gifted and talented children and teenagers outside the normal IQ paths, making it possible to sometimes detect gifted underachievers. According to Dabrowski’s TPD, also called the personality theory of the 21st century (Sal Mendaglio, 2008) development happens from low to high through positive disintegration. TPD is a theory of personality development in which are distinguished five levels, they are not stages: not every human goes through all levels. Dabrowski worked in his life with many highly gifted individuals. gifted individuals have what he calls “developmental potential”, which is a condition but not a guaranty for further growth. Only the great of the earth achieve the highest level. Dabrowski distinguished five OverExcitabilities (OE) among the gifted: psychomotor, sensual, intellectual, imaginative and emotional channel, for all five channels he tells how they are expressed. Not all gifted persons have all five overexcited abilities, but to have intellectual, imaginative and emotional overexcitability is an asset to developmental potential. Dabrowski saw ‘autopsychotherapy’ as developing yourself towards internal and external harmony and to become a better human being. He spoke about dynamisms, driving internal forces, like shame and guilt, that activate and accelerate growth. Compared to everyday shame known to all, at a higher level, shame can be felt when one is not yet being able to live up to one’s own ideal self-image. Besides the dynamisms Dabrowski also described the fifty so-called functions, feelings, that have at every level another content, he speaks then of ‘multilevelness’. Primitive is seen as unjust, input of moral feelings, going against one’s own advantage. Altruism is seen as just. Just and unjust is experienced and systematically organised with principles. Active realisation of justice. Universal love above justice, self-sacrifice, others needs above one’s own. Multilevel Emotion Regulation Theory (MERT) is a holistic theory developed by Simone de Hoogh. The theory explains how more-able neurodiverse (young) individuals and parents of neurodiverse children can develop emotional regulation skills and direct their energy towards self-chosen goals, and contribute to society.